At the beginning of the episode, Zoe comes from home from a special date with a guy named Sean, who works on Wall Street and is ready to help her move on from her husband. As they ride of the elevator up to Zoe's condo, the two kiss on the elevator. However, as the doors open, Xavier and Gemini are in the living room The doorman, Amir, who is a fan of Gemini, "neglected" to tell her that Gemini was there. When Sean himself starts obsessing over Gemini, Zoe promptly kicks him out. Afterwards, Gemini states he plans to buy Xavier new stuff for their weekend together, though Zoe objects. 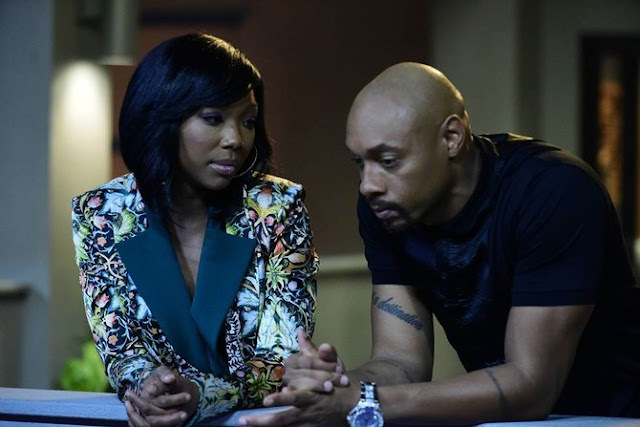 With co-parenting, they have to be on the same page, and Zoe doesn't feel like Xavier needs a bunch of material things. In spite of their tension, though, it's clear that they still have a soft spot for each other! Zoe and Gemini have been separated for a year, but neither of them will sign the divorce papers! 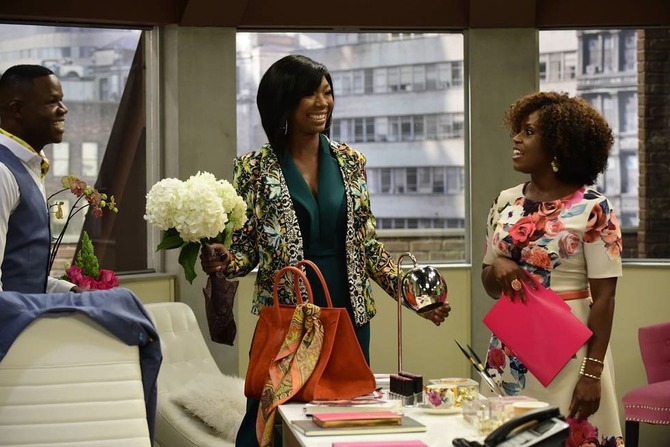 The next day, at Zoe's cosmetic company, Zoe's publicist Pearl (Haneefah Wood) tries Tinder to find her a guy, with the assistance of Zoe's assistant Valente (Tory Devon Smith). When Zoe arrives, Pearl discusses the company's recent pop-up show, and reveals that Lupita Nyong'o's makeup artist was there and liked the products. It's possible that Lupita could be the new face of Zoe Moon Cosmetics! At that moment, Xavier comes in with Gemini, who reminds Zoe of a parent-teacher's conference they have that morning. Valente completely forgot that her assistant forgot to tell her about it. As they walk to the elevator, Gemini notices that it's extremely hot in the building and tells Xavier to remind him to have it fixed. Xavier records a note on his new iPhone that Gemini bought him which Zoe confronts him about in the elevator after telling Xavier to sit down. At the end of the day, he's only 8! What does he need with a brand new iPhone?! After they get off the elevator, they realize that Xavier has mysteriously disappeared! They do eventually find him, but arrive to the conference late. Zoe awkwardly explains to the teacher what happened and apologizes. However, Xavier's teacher states that boys often act out when their fathers aren't in the home, knowing that Zoe and Gemini are going through a break up. Though Gemini may not be living with Xavier anymore, it's clear that he makes time for his son. Of course, Gemini gets offended and walks out. Meanwhile, back at the office, Pearl stresses about texting a guy she found on Tinder. Valente tells Pearl to text from the heart. Instead of playing it cool though, she asks the guy randomly what he's doing on November 14, which is the day she plans to get married at the Plaza! What?! Can you get to know this guy first before you plan out an entire lifetime in your head??? HA! When Zoe gets back, she realizes that there is a bunch of construction going on to fix the A/C. It pisses her off because she knows it was nobody but Gemini who ordered this. Miguel Maldonado (Ignacio Serricho) is the head of the contracting firm, and he states that she has more issues than she thought, including plumbing issues and mold. However, Zoe firmly states that she is the owner and didn't authorize all this work. Miguel tells her that the place is a mess, and he's just doing his job. If she has an issue with that, she needs to take it up with Gemini. There seems to be a hint of hidden interest between the two, so I wouldn't be surprised if they hook up later in the season. Zoe plans to go OFF on Gemini tonight for all of this, though. When she gets home, Zoe sees India Arie standing in her living room, and the singer performs her hit "Ready For Love." Gemini planned this grand gesture to try to butter her up, knowing that she'd be upset. She sees right through it, but his words do end up softening her heart a bit. He takes her to the balcony, where he has 20 doves released for every year they were together. Gemini says that he could have never achieved any of their dreams without her. They kiss, before they are interrupted by Gemini's phone. Zoe admits to him that she felt slighted and invisible in their relationship, and now, with her cosmetics company, she feels like she has purpose. While she's saying all of this though, Gemini is texting another girl, proving that he hasn't changed one bit. The way he treated her was not okay, and she refuses to go back to that. She pulls out the divorce papers and signs them, which angers him. However, he signs them too, believing that she won't make it without him. "I guess we'll see," Zoe says. Xavier sees all of this, and storms off, mad at his mom. He's upset about what's going on, and it's understandable. Zoe says she's taking a breather from his dad to feel better about herself. However, that doesn't mean that Xavier's not important to Zoe and Gemini. Xavier, though, is worried more about who will take care of her, and Zoe says that they will take care of each other! Though there was a major overuse of the laugh track, this is a cute, decent show. I love some Brandy, so it's great to see her on TV again. I'm really interested in the storyline itself, so I'm excited to see what BET brings to the table. 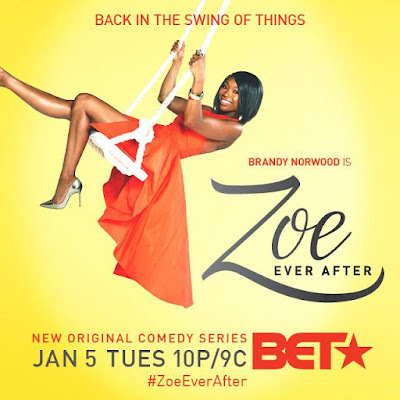 Check out all new episodes of Zoe Ever After on Tuesdays at 10 p.m only on BET!